The years between 1979 and 1981 were a dynamic period in the young artist, Jean-Michel Basquiat’s, life. It was a time when he helped form the band Gray, met fellow artists Keith Haring and Kenny Scharf, and appeared as a guest on Glenn O’Brien’s notorious, avant-garde show, TV Party. Basquiat had his eyes set on fame: he had just ended the collaborative graffiti project SAMO© (with Al Diaz) and his solo career was beginning to gain immense traction. It was also a time when Basquiat was a close friend of Lonny Lichtenberg, a drug dealer whom the young artist would nickname Neptune, King of the "C". It is believed that during these years, Lichtenberg would come to aquire a series of sketches by the teenaged Basquiat, 16 of which have just gone on show at Art Basel in Switzerland. Belonging to a larger group of around 42 drawings and paintings, known as the Neptune collection, these pieces are now all owned by anonymous collectors. Despite the fact that they are yet to be authenticated by the Basquiat estate, the individual works were on sale at Basel at prices ranging from $45,000 to $120,000. The sketches, often cursory drawings chalked out on small scraps of paper, are telling artefacts of the artist's nomadic teenage years, in which he would rapidly assemble works of art from whatever fragments of materials he had to hand. Most of them are portraits, and in many ways they foreshadow the iconic "heads" that the artist would paint only a few years later as his alter ego, Aaron. In these early drawings, hastily dashed off as currency for food or shelter – as illegal tender for drugs – we already see many of the motifs that Basquiat would later reproduce on his immense canvases that today sell for vast sums of money. The show at Basel was curated by Diaz, who, on the phone from his home in New York, having just returned from Switzerland, spoke to Dazed about this public exhibition of his friend's early sketches. Can you tell us about how you came into possession of the Basquiat sketches being shown at Basel? Al Diaz: I do not own those drawings. I'm representing a collection of works owned by two separate people, who want to remain anonymous right now. The guy who owns the works that were just shown at Basel, the Neptune works, is the primary source. He was a friend of the drug dealer of Basquiat's, who I personally knew as well. That's where those came from – they have kind of a dark past. But I know precisely where they came from – an apartment on 12th Street – and that's why I repped them. 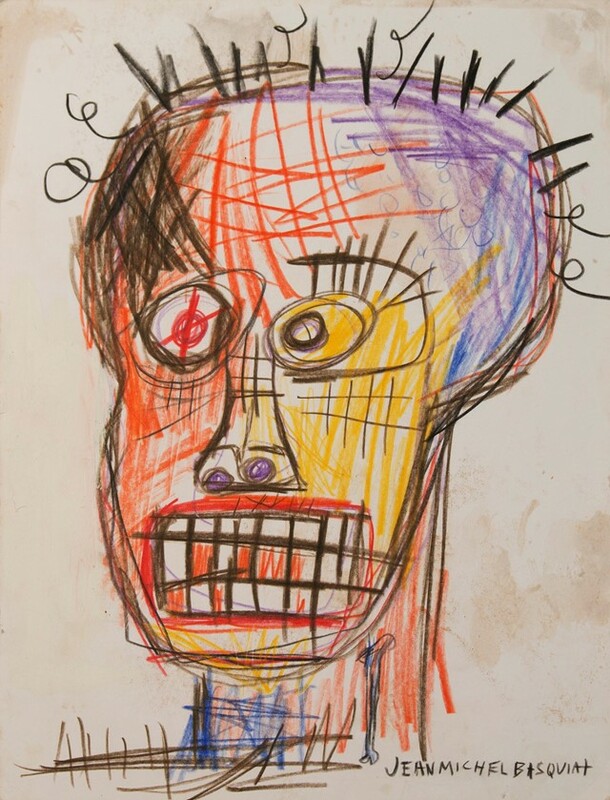 Those early drawings were Basquiat trying to refine that head that became known as the ”Aaron Head”, and fusing elements that would be recurring motifs in his work – little cars, bones etc. He wasn't really painting yet, he was still using cheap materials, whatever he could get his hands on. So these weren't intended to be sketches for any kind of paintings, they were just sketches for him working on his ”head”, which is one of the first things that he would instinctively want to draw. So you personally knew the drug dealer whom Basquiat was friends with at the time? Al Diaz: Yeah, I knew Lonny. I used to buy drugs from him myself. Not only was I friends with Basquiat, but I knew this person that obtained these works, who would later lose these works because his life spun out of control, and he ended up homeless. So that's how the second party – whose name I'm going to have to leave out – acquired them. Was Basquiat exchanging these works for drugs? Al Diaz: He probably did. I'm not going to say that he did or he didn't. There's a very good chance that he did, yeah. Although this is before he was famous, so someone would have had to really like the piece, because it wasn't as if it was worth anything. He wasn't “Jean-Michel Basquiat” yet. He was just, you know, Jean-Michel. I'll tell you what though, people wanted to hang out with him. He was a person in demand. So people might have traded stuff with him. Lonny might have traded with him because everyone wanted to hang out with Jean – he was like the cool guy to hang out with. The works exhibited at Basel are yet to be authenticated by the Basquiat estate. Al Diaz: That’s true about a lot of works of Basquiat's. Some stuff in the Navarra catalogue is not authenticated, know what I'm saying? I would not get myself mixed up with anything that I thought was even close to fake. For the few of us that actually knew him, the source is very, very strong. And the works speak for themselves. It's early Basquiat, for those who know what that looks like. Are you involved in any other projects at the moment aside from the Basquiat exhibition? Al Diaz: Yeah. I have quite a few shows going on. I'm showing in Beyond the Streets, which is a major graffiti/street art show in Los Angeles right now. And I'm also in a group show at Howl! Happening, which is called Zeitgeist. It's about the art scene around the time of Basquiat's teenaged emergence into fame and fortune. I was also asked, by the school that I and Jean-Michel went to, to come back and do creative stuff with the current student body. That was very flattering and very inspiring and, you know, it was a cool thing to do. It was a very important place for us, for me and Basquiat.